These shoes demonstrate the important role costume plays in the iconography of the contemporary rock and pop performer. 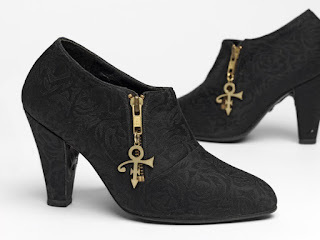 Known for his energetic stage leaps, Prince’s shoes had special metal braces fitted between the heel and outersole as reinforcements to sustain the physicality of his performance. This creative solution, almost invisible to the audience’s eye, supports the shoe’s structure and ensures no discomfort to the wearer, which is testament to the design and craft skills necessary for a world class performer. The V&A is the leading museum for art, design and performance, and the shoes will join the V&A’s National Collection of Performing Arts that houses rock and pop costumes such as outfits designed for and worn by Elton John, Mick Jagger and the Beatles. Prince Rogers Nelson (1958 – 2016) was an American singer-songwriter, actor, multiinstrumentalist, philanthropist, dancer, designer and record producer, who was known for his eclectic work, flamboyant stage presence, extravagant dress and make-up and wide vocal range. He was a musical innovator who released 39 studio albums between 1978 and 2015, selling over 100 million records worldwide, making him one of the best-selling artists of all time. Prince’s career tells a strong design story of complex iconography. Prince’s albums were always accompanied with a powerful visual image, and he used costume and artwork to play with his visual identity. Prince’s albums were always accompanied with a powerful visual image, and he used costume and artwork to play with his visual identity, frequently challenging traditional notions of masculinity, race and sexuality. Standing at 5ft 2in, his high heeled shoes were an intrinsic part of performer and performance. The shoes are now on public display in the Theatre and Performance gallery of the V&A .